World’s Largest Omelette Of 110,000 Eggs. An omelette is a preparation of beaten egg quickly cooked with butter or oil in a frying pan, usually folded around a filling such as cheese, vegetable, meet , or some combination of the above.this is how we see omelette.now see this. The Turkish Egg Producers Association to promote eggs as a healthy primary food source cooked an omelette weighing 6 tonnes with a total of 432 litres of oil and 110,000 eggs used – setting the record for the Largest Omelette. 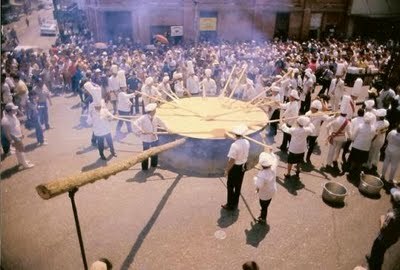 The feat took 432 liters of oil, 10 chefs, 50 cooks, and at least one chicken.Around 80 chefs cooked the World’s Largest Omelette in a 10m round frying pan, using 110,000 eggs.Carim Valerio, from the Guinness Book of World Records, watched the record attempt and confirmed it had been successful. Previous article Facebook Vs Google statistics, Facts And Figures. Next article In Some Countries People Eat Balut(egg) fertilized duck embryo. Facebook Vs Google statistics, Facts And Figures. In Some Countries People Eat Balut(egg) fertilized duck embryo.